Flying Scot number 387 was completely reconditioned by Flying Scot, Inc, Deer Park, MD in the spring of 2007. This is basically a 2007 boat. This is a beautiful and original Gordon Douglas Scot. 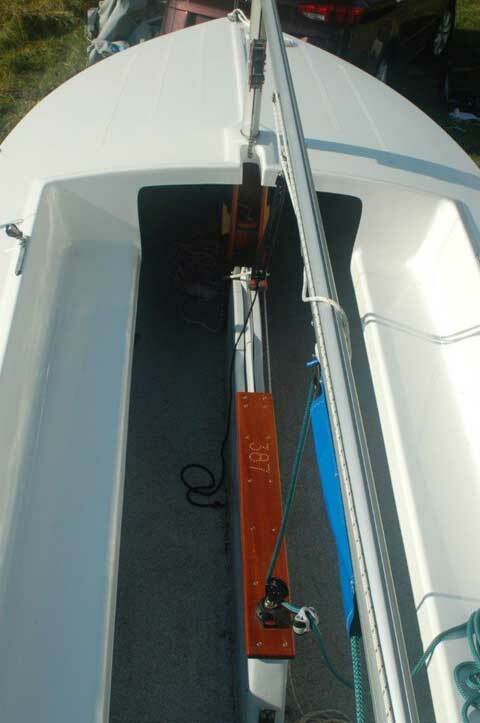 The boat has a white hull with blue striping and is outfitted with the standard "Family package" rigging. Main: Schurr sails. White daysailing Main. Blue numbers. New in 2007. 2 reef points installed in main spring 2015. Generally clean with crinkling from use. Still crisp. Roller furling jib. ?Age(bought used). White with window and UV cover (window replaced spring 2015). Standard Harken roller furling gear. 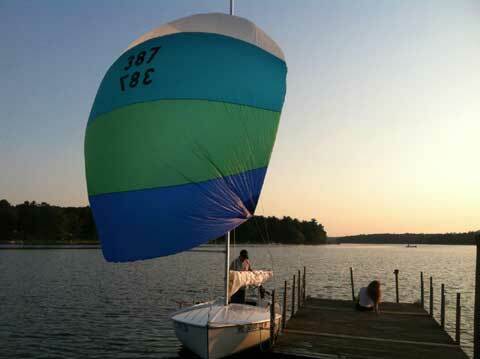 Radial head spinnaker. Schurr four color. 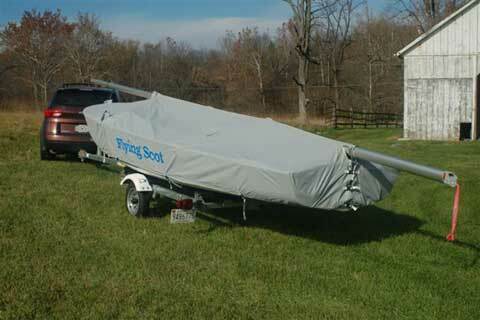 Comes with all spinnaker rigging, spinnaker pole, and 2 rear spinnaker cleats. Used 3 times. New in 2009. Royalty tags on all sails except roller furler. Mahogany centerboard top and winch. The Wood is still perfect. 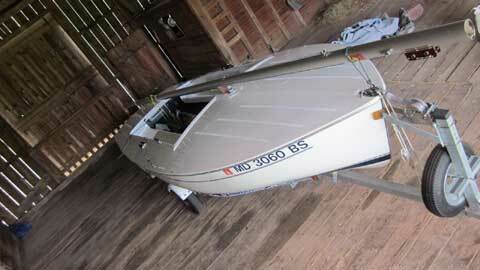 Flying Scot completely reconditioned the original hull and applied a new gel coat in 2007. The hull has two small gelcoat chips on keel(finger tip size) and small scuff on waterline stripe but otherwise looks new. Blue boom cover or tent. Spare winch handles, winch lube, and spare pins. Galvanized steel made by Loadrite. 2007. Tires have minimal wear and lights work. Comes with spare tire and trailer jack. Both boat and trailer titles are clear. Flying Scots are fast, safe day sailers. They are a blast to race or cruise with the family. They have been in production since the 50's. American Sailboat Hall of Fame Inductee. 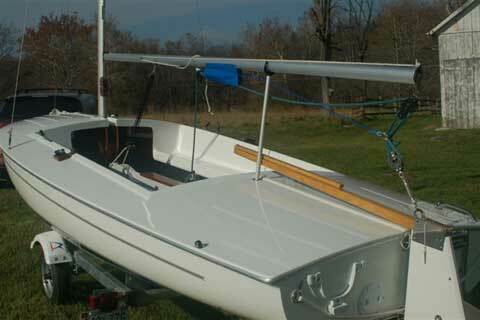 The hull is handmade with fiberglass and balsa to make it very rigid. Length, waterline . . . . . . . . . . . 18' 6"
Beam . . . . . . . . . . . . . . . . . . . . 6' 9"
Draft, board up . . . . . . . . . . . . . 8"
Draft, board down . . . . . . . . . . . 48"
Mast height, above water . . . . . 28' . Sail Area, main & jib . . . . . . . . . 191 sq. ft.
Sail Area, spinnaker . . . . . . . . . 200 sq. ft. Weight, all up . . . . . . . . . . . . . . 850 lbs. Gross Trailering Weight . . . . . . . 1200 lbs.